I sing the song of Tim Lincecum, who fought through the roughest season of his life and survived to show us why he's a two-time Cy Young winner, leading the league's finest pitching staff through a rousing September pennant chase and one of the most memorable postseason performances in baseball history — well, certainly Giants history. Matt Cain had the 0.00 October ERA. #MadBum had the shock and awe of youth. "Dirty" Sanchez had the attitude — when he wasn't being mocked by the road crowds. But "Big Time Timmy Jim" drew the toughest assignments and came out on top (nearly) every single time. 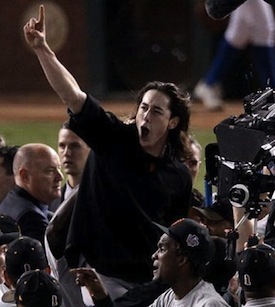 How good was Lincecum in the 2010 playoffs? Good enough to beat fellow Cy-Youngers Roy Halladay and Cliff Lee a combined three times — and I'd posit that he out-dueled the Doc in Game 5 of the NLCS, despite taking the loss. In NLCS Game 1, he brushed off the wolf whistles and tasteless mockery of Philly Phanatics to twirl a 7-inning gem. In the decisive Game 5 of the World Series, Timmy struck out 10 over 8 innings, allowing only a solo homer to Nelson Cruz before giving way to Weezy in the 9th. For my money, that beats his 14-K night against the Braves to open the playoffs. I was at the Cove for the NLDS game, and I can attest that Timmy was electric. After a leadoff double, Atlanta had none chance, and with a 1-0 lead, our dynamic young hurler had zero margin for error. But deep in the heart of Texas, under the brightest of lights, against a pitcher nobody on earth thought could be beaten — let alone twice in the same series — this kid made the entire sports media universe eat a big helping of crow. The picture above tells the whole story. Edgar Renteria was the hero of the evening, but only one Giant deserved to be carried off on the shoulders of his teammates. It's no secret why six teams (!) got cold feet over a Golden Spikes winner and the Pac-10's all-time strikeout leader. If you listen hard enough, you can hear every scouting director's exact words: "He'll never last with that funky windup." Well, Giants fans who've come to know their Ace and his dedicated father, Chris, understand that the funky windup is what transforms Tim into Timmy and Timmy into Big Time Timmy Jim. We've read Verducci's SI cover story. We've listened to "Father Knows Best" with Mychael Urban — sadly no longer a part of Giants weekend broadcasts on KNBR. Most of all, we've watched this kid as he's developed into our team's first superstar since Barry Lamar Bonds. And those of us who've been on his bandwagon from the start know one thing for certain: Tim Lincecum's not going anywhere except up, up, and up. And as he goes, so go your San Francisco Giants. Sure enough, when he took to the bump in September, Timmy had made the adjustment every great player needs to make early in his career, once the league starts to catch on to what he's doing. Over his final six regular season starts, the Freak went 5-1 with a 1.94 ERA, 0.94 WHIP, and .201 OBA. He didn't have to skip a single start or work out the kinks in the bullpen. He did it on the fly, in the middle of a pennant race, with all the eyes of the baseball world watching and waiting for him to fall to pieces. No doubt, this team would not have hoisted the Commissioner's Trophy without contributions from all 42 men who wore the orange and black in 2010, but there is no one player who meant more to their success than this guy. We knew that before the season even began, but that god awful August made it abundantly clear. Take him out of the mix, and this team doesn't even sniff the postseason.